With its development overseen by revered design chief Laurence Pomeroy, the Daimler 15 was introduced in October 1932. A refined yet frugal motorcar, its ladder-framed chassis featured all-round semi-elliptic leaf-sprung suspension and four-wheel drum brakes. Powered by an 1805cc OHV straight-six engine allied to four-speed pre-selector transmission (the latter incorporating Daimler's famously advanced fluid flywheel), the newcomer was reputedly capable of 64mph and over 20mpg. Supplied as a bare chassis and bodied by the likes of Mulliners of Birmingham among others, the model could be had in saloon, sports saloon, fixed-head coupe and drophead coupe guises. Progressively developed, the 15 remained a staple part of the Daimler range until 1937 by which time its engine capacity and wheelbase had grown to 2166cc (via 2003cc) and 9ft 6in respectively. First registered on 13th January 1935, this particular example is finished in black with a red coachline and blue leather upholstery. Wearing elegant two-door fixed-head coupe coachwork by Mulliners of Birmingham, it is understood to have changed hands just twice in the last fifty-five years. Belonging to Herefordshire resident Reginald Lea Court Esq from 1955 - 1979, it subsequently passed to Cyril Thomas Allcorn Esq of Hampshire before entering the current family ownership. The last MOT certificate on file was issued during October 1984 at 27,543 miles and the Daimler would seem to have barely turned a wheel since then (its odometer currently shows 27,546 miles). Stored in an open-fronted building for many years, the 15 now requires restoration. Riding on wire wheels and sporting faux dumb irons to its fabric covered roof, the four-seater is seemingly complete and perhaps sounder than one might expect. 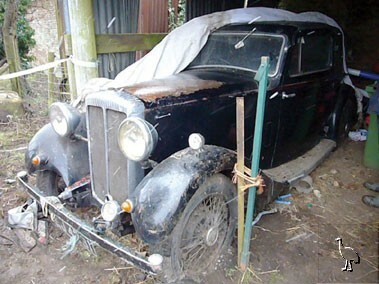 A potentially rewarding project, this stylish Daimler coupe is offered for sale with old style V5 Registration Document, continuation buff logbook, lubrication chart, maintenance manual, three expired MOTs and correspondence from Mr Court (dated June 1983).